Cottonwood Outdoors® Weathershield Treestand Replacement Seats. A comfort upgrade for your trophy-tracking quest! Perfectly comfortable, perfectly weatherproof replacement seating for virtually any sling-style seat! No matter who made your stand, Cottonwood makes it better. Completely waterproof fabric, completely weatherproof construction... designed to keep you (and your keester) as comfortable as possible while you hole up and wait for your shot. Fits standard size frames with seats that face away from the tree. Nice extras like kidney warmer pocket, water bottle storage, and accessory pockets make this Seat the king of comfort and convenience! Base cushion measures 20 x 14". Back rest measures 13 x 28". Heavy-duty quick-release buckles for quick deploy. 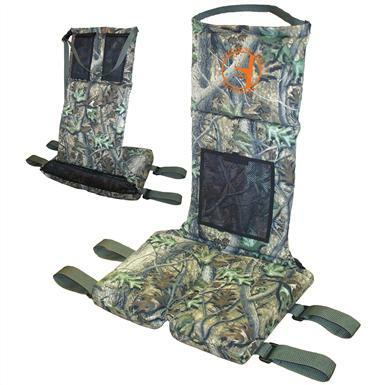 Cottonwood Outdoors Weathershield Treestand Replacement Seat, Supreme is rated 4.0 out of 5 by 1.